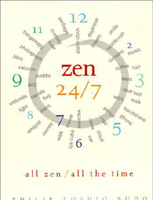 Excerpted from the introduction to Zen 24/7: All Zen/All the Time, a HarperSanFrancisco publication, by Philip Toshio Sudo. Order your copy of the book here. Any and every action can be a source of insight--even enlightenment--whether it's tooth brushing, going to the bathroom, or opening a can of beer. That's the promise of zen. No matter what we do or where we go, zen is available to us 24/7: twenty-four hours a day, seven days a week. It never goes away, no matter how routine the day may seem. The most mundane details of life contain zen's profound truths, if we're of the mind to look for them. It's easy to find significance in those days that rise above the ordinary--a graduation, perhaps, some great athletic or career triumph, a wedding, the birth of a child. But what about all the days in between? The aim of Zen 24/7 is to look at the everyday, ordinary parts of our lives and see the meaning in them, too; to become so absorbed in the commonplace that we come to know a deeper reality. In so doing, we make today--plain old today--a truly special day. Zen teaches that our approach to today determines our whole approach to life. The Japanese call this attitude ichi-nichi issho: "Each day is a lifetime." We arise in the morning newly born. As we pass through the day, we age and gain experience. When we tire at day's end, we "die" and take our rest. That one arc serves as a miniature of our entire life. In that sense, what we do during a single day--and how we do it--becomes the foundation of our whole lifetime. For what is life but the sum of our days? This very day can be a life's turning point. In a single moment, we can decide to walk the path that has no end.